Among his various sculpture works that he has displayed online, artist Carl Turner has expressed or suggested his influence by sources as varied as taxonomy, Lovecraft, The Beatles, and Dr. Seuss. However, his self-titled blog displaying images of his most recent sculptures suggests an undeniably fantastic bent to his work and even some leaning toward the literary. Many of Turner’s most recent sculptures have catalogued an island of fictional fauna. The animals, including the Screwloose Moose and the Baffler Bird (right), are expressive, curly, and colorful. I found Turner’s self-identification with Seuss’ artwork spot-on – his sculptures run on a similar imaginative vivacity that carries the viewer along. The works sometimes really do seem like children’s book animals made real. The detailed sculpted and painted lines invoke the verisimilitude of the taxidermist without losing the playful softness of the large eyes and poignant expressions. Even “Fishbaby,” a mixture concept which seems initially unsettling, feels wondrous rather than uncanny because its very human face seems so peaceful. I found perhaps most interesting the story of the world behind the sculptures that Turner had crafted. The posts displaying the animals often reference “Scoffer’s Island,” and Turner’s fictional history of the island’s discovery sets the pieces in an atmosphere of lost possibilities. Turner’s narrative made me look at his work a second time as though any of these bright, emphatic animals could be found in our own world if we explored a little harder and embraced the world’s natural magic. 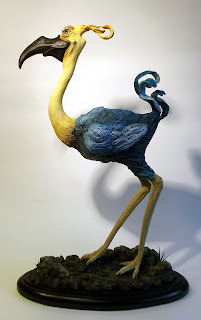 His blog includes a link to a gallery of some of his other work, including sculptures of further fauna and some flora-fauna combinations, all of which seem to embrace a fusion of the fictional and the natural worlds. What influences you to focus on fantasy creatures in your art? Can you point to any artists or works that you feel made you want to try exploring the imaginative in this way? Carl Turner: I‘m a huge comics fan, and although it may not seem all that obvious in the works themselves there is definitely a comic book influence; artists like the great Jack Kirby whose monsters and creatures populated the silver age Marvel books . 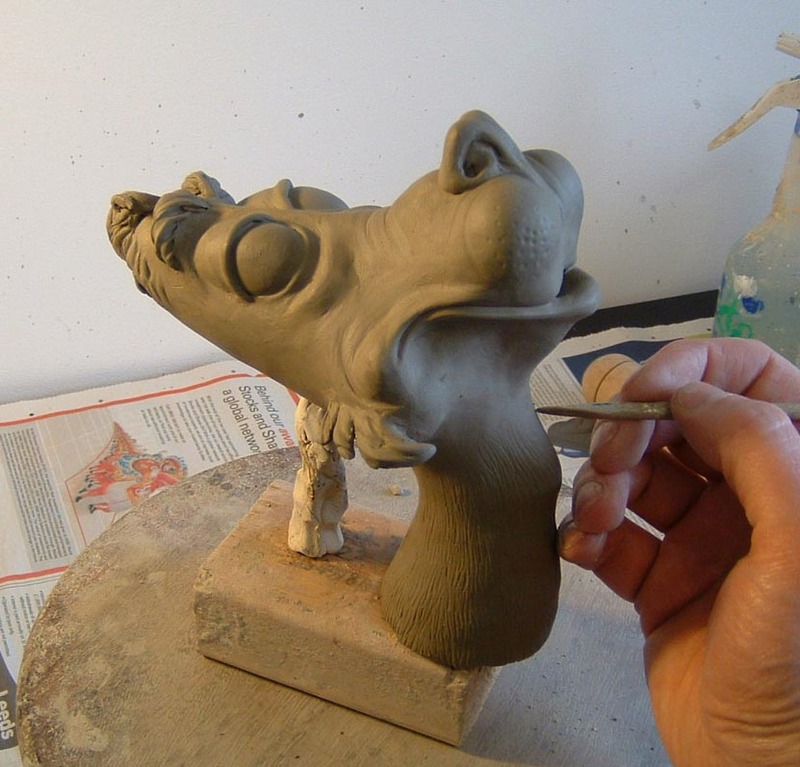 When I first started creating works in clay I was very influenced by the Martin brothers who were these nineteenth century studio potters, they created wonderful and bizarre creatures including grotesque birds which doubled as tobacco jars. The imagery in their work has always coalesced in my mind with that of Dr. Seuss who is, of course another strong influence on my art. In more recent years I have been following the emergence of the ‘lowbrow’ movement which, in artists like Todd Schorr and Mark Ryden effuses a bizarre fusion of pop art and surrealism. What pieces did you most enjoy creating? Why so? Regardless of the sculpture, there are certain parts of the creative process that I always enjoy, usually the early design stages when what may have been an abstract notion in my head starts to take on a physical existence. The later stages of the process, sculpting, painting, mounting etc, I actually find rather laborious but I get a feeling of satisfaction when a piece is completed. I’m pretty ruthless when it comes to the standards I set myself. If I don’t feel that a sculpture works I consign it to the bin, whatever stage it’s at. I’m enjoying making the Scoffer’s Island sculptures at the moment; they have a real presence, and each has its own unique character. It’s funny; they start to take on a life of their own, almost independent of my original concept. You have displayed a lot of your work with clay and paint. What do you think makes these mediums so well-suited for creating the images you want to create? Well I’ve tried lots of other mediums, polymer clays and the like but there is something magical about taking a base material like clay, which is essentially refined mud, and turning it into a substance so hard that it can remain unchanged for millennia. 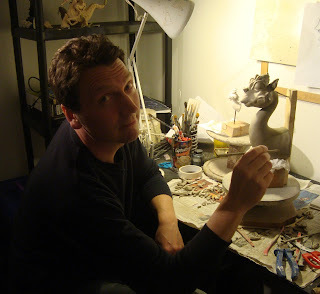 From a sculptor's point of view I also find it much more responsive to work with. I’m not a purist, I also employ other mediums, and most of my sculptures would probably be classed as mixed media. I use acrylic paints which I sometimes apply with an airbrush to give me complete control over the range of textures and colours that I need. Which came first – the artwork, or the story of Scoffer’s Island? How do you feel the story you’ve made affects the art you’ve made, and vice-versa? The two came about in my mind simultaneously. I always create an imaginative back story for my sculptures. Most of the time I keep it to myself, it’s just something that I bear in mind to help bring the character to life for me. Hopefully this will help to make the sculpture convincing and be believable, even if it is fantastic in subject. In the case of Scoffer’s Island, because I was creating a sequence of interconnected works, I decided to write the story down and include it on my blog. I’m usually more than happy for folks to invent their own stories for my characters. You caption one photo of “Fishbaby” with a comment about having caught it locally. Why connect these imaginative pieces to the river Severn specifically or to the real world generally? Again, I was creating a background for the sculpture in an attempt to contextualise it. I’ve always been interested in myths, folklore and forteana, I imagined that there really was this history of strange human/fish hybrids being pulled out of this particular body of water. I chose the Severn because it is the closest large river to where I live and played a part in my childhood- my own personal mythology if you will. I photographed the sculpture prior to mounting, lying on the grass as if it has just been landed as a little visual joke, echoing the dubious photos of bigfoot, fairies, mermaids and the like. At the end of your narrative about Scoffer’s Island, you describe how Scoffer spent the end of his life trying to convince his audiences that the island was real. How do you feel like your work does or does not need grounding in the truth? Do you ever have to defend the imaginative nature of your sculpture? I think that the best works of fantasy are created by those who present their works as part of a ‘real’ albeit imaginary world. That sounds like a contradiction but if you look at the books of Tolkien for instance; he created languages, histories; maps, extensive writings that were never primarily intended for publication. The reader doesn’t need to know any of this in order to enjoy a good story but it gives the work a depth that enables the reader to connect with the characters and places. 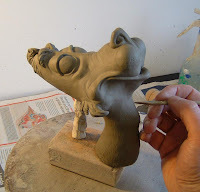 When I am creating a sculpture, I start by looking at real animals, even though the end result may be stylised to the point where it barely resembles the animal, the essence of the living creature remains. 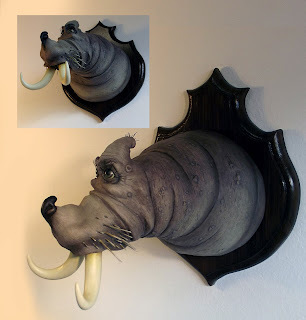 I have done realistic, representational sculptures of animals in the past, but for me it’s more interesting to create my own weird and wonderful beasties. I am able to give substance to my own zoological fantasies; it’s a bit like being creator god of my own twisted little universe! All images copyright Carl Turner. Used with permission.